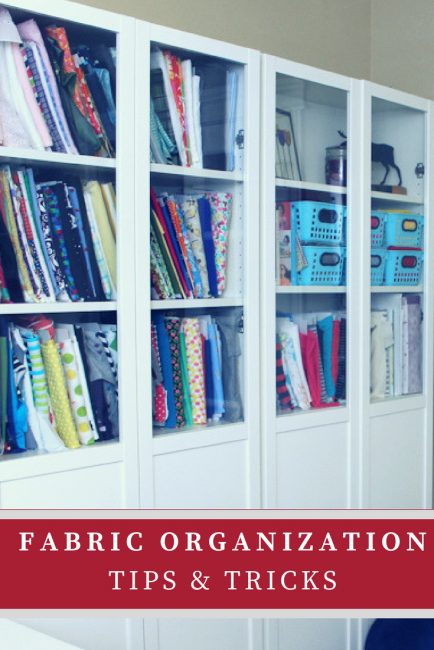 I admit it…I hoard fabric 🙂 If you have a tendency to collect as well then you definitely need these fabric organization tips to keep you sane and your sewing space tidy! I’ll warn you now that this post is a bit long but hopefully you’ll find something to help you keep the stash under control. Have some extra space for your stash to grow. 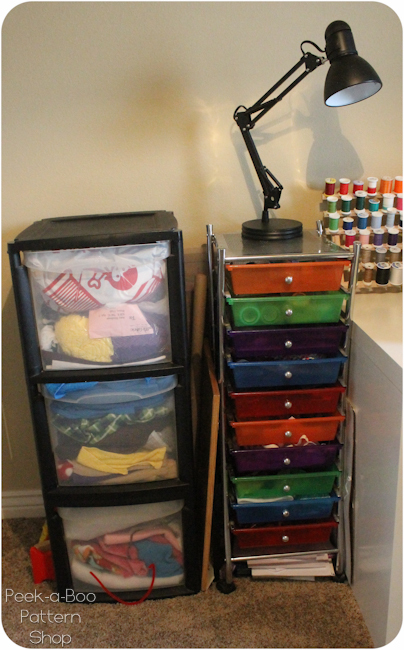 I’m always using my fabric and supplies but I also buy more so having some space to put those things away when I stock up is essential. When things get too full it’s time to do some stash-busting but if you have absolutey no extra space to begin with your system is doomed to fail. Now on to the tips! 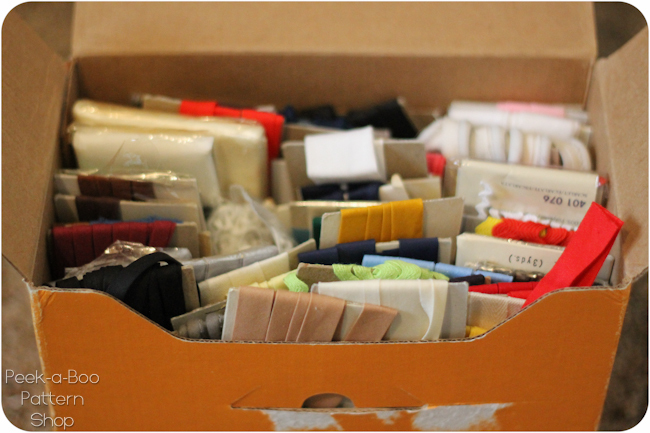 I keep the bulk of my fabric on my bookshelves with the yardage folded on comic book boards. I found mine on Amazon (100 boards for $12.95). I thought that would be plenty but I’m now working on my second set of boards 🙂 Basically you just wrap your fabric around them like a bolt you’d find at the fabric store. 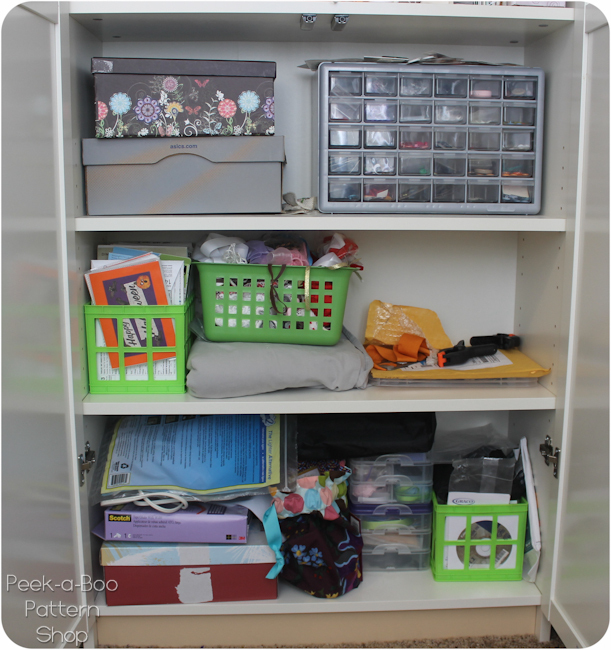 It keeps everything neat and tidy and it’s easy to see what you have in your stash. 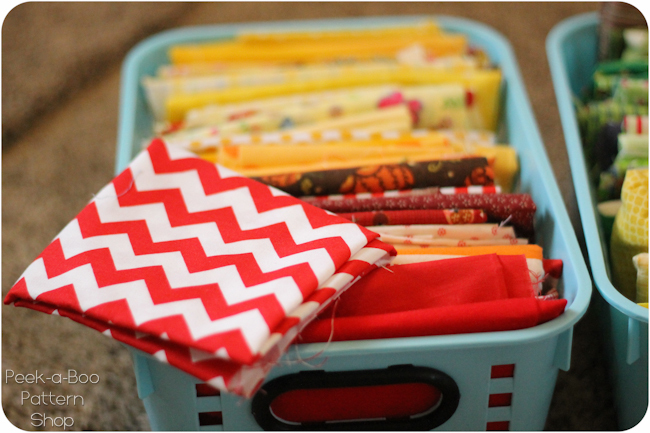 I sort by fabric type (wovens and knits) and I have anything from 1/4 yard cuts up to 2-3 yards stored on these. Seriously love them! My bookshelves are the BILLY shelves from Ikea. I added on the glass doors and they are perfect! 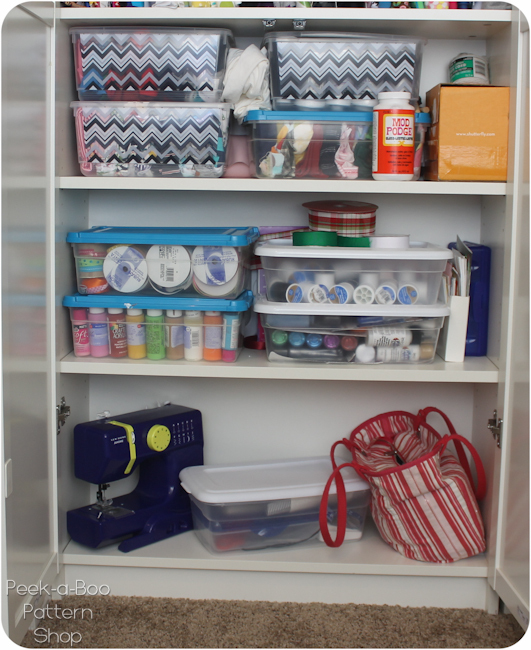 I can showcase my pretty fabrics up top and then hide a lot of other supplies in the lower half. It also deters my kids from de-shelving everything as they’re a bit hard to open without any knobs. 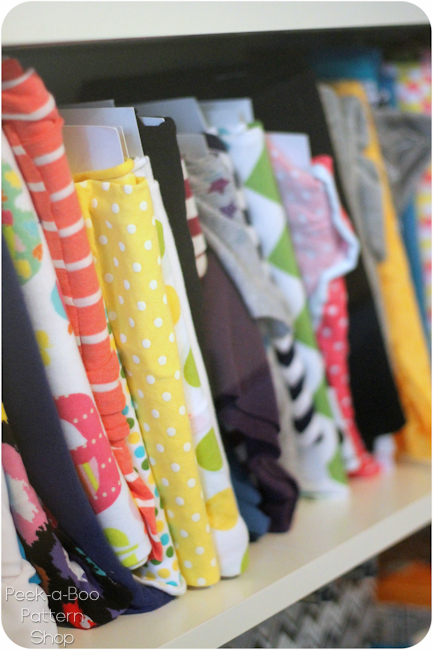 I save pretty much any usable scrap and they get pulled out all the time for appliques or small projects. 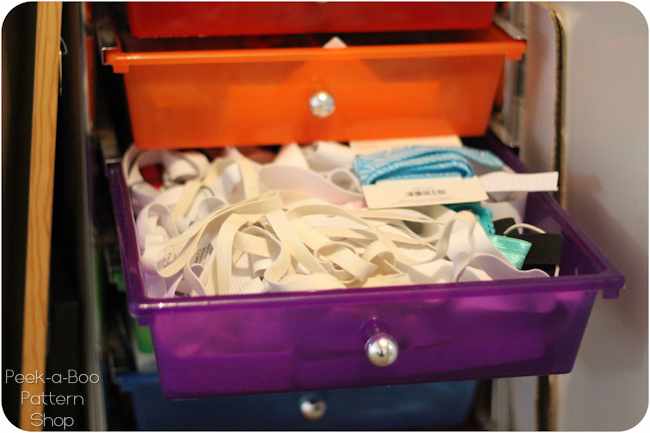 I’m always glad I have them 🙂 The woven scraps are sorted by color in these little bins I found at Jo-Anns on the top half of my other bookshelf. 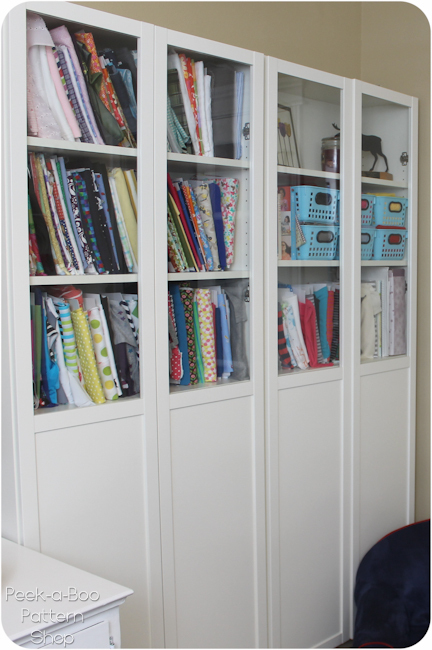 My sewing desk also has a few cubbies and I use one for fabric organization to store all of the projects I’m currently working on. Items I don’t use frequently (more upcycles, my Cricut, scrapbook paper, etc.) are stored in the bottom cubbies. I keep my scissors, tape, seam rippers, etc. in the little drawers and other frequent use items in the little black shelving unit on my desk-top. 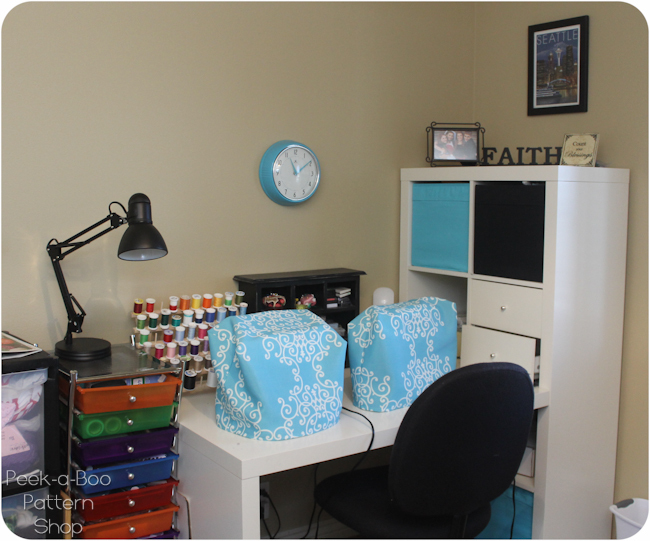 It was a huge under-taking to get all the fabric organization set up but I love it! Everything has stayed right where it belongs for over 6 months now which I think is a good sign that this system will continue to work well for me 🙂 I’ve had many other systems in the past and they all failed miserably so I’m glad to have something that works! 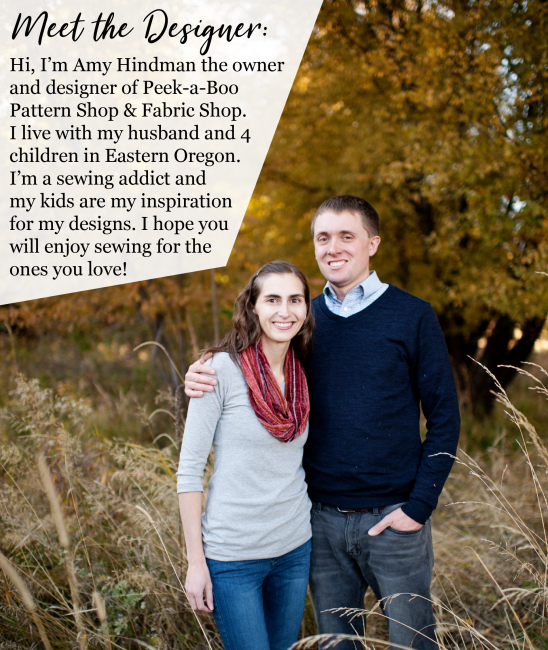 Hi Amy, I’ve just found this page and have a question. 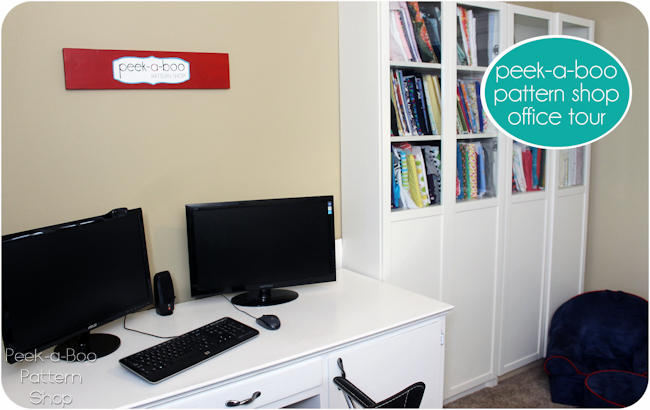 How do you store your electronic patterns? 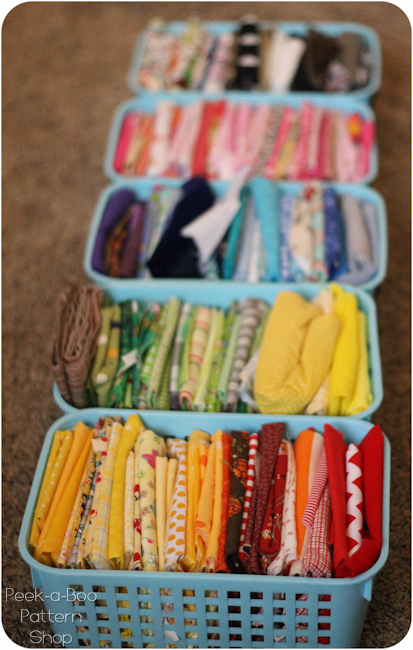 How do you organize them and keep track of them so you know you already own it and do not purchase it twice, something I did recently ;-( I sew clothes for my granddaughter and myself and I quilt. So I have some paper patterns but more and more are PDF only these days. Thank you for taking the time to create these posts and share such a great resource! 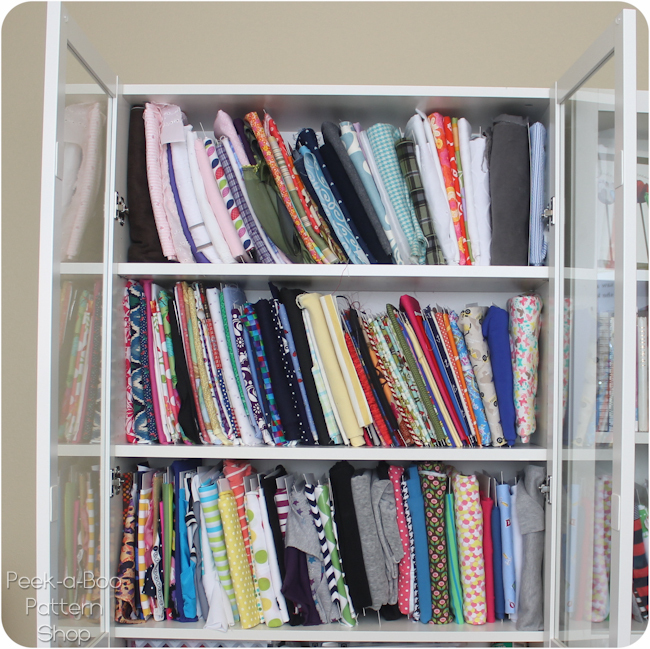 Amy – what size comic boards are you using and how much fabric can you put on one board? I normally by 2 yards of one fabric at a time. No way do I want to cut in half just to wrap on a board. Thank you! 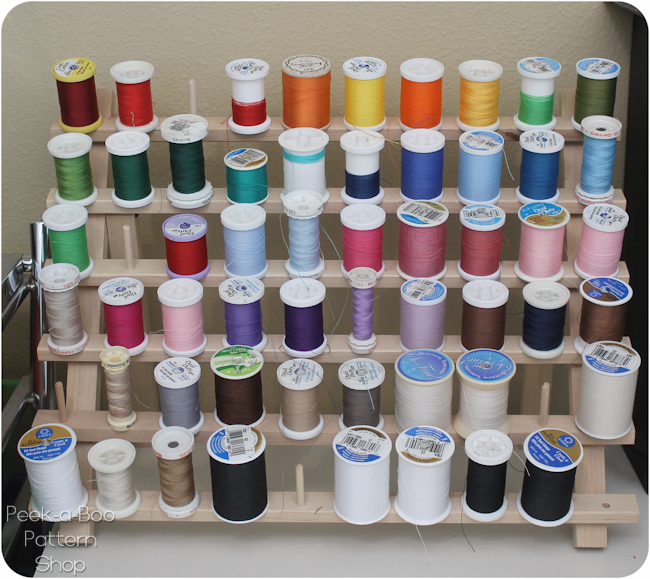 I found a really neat idea to store bobbins … in ice cube trays. Three to a cube and stackable! 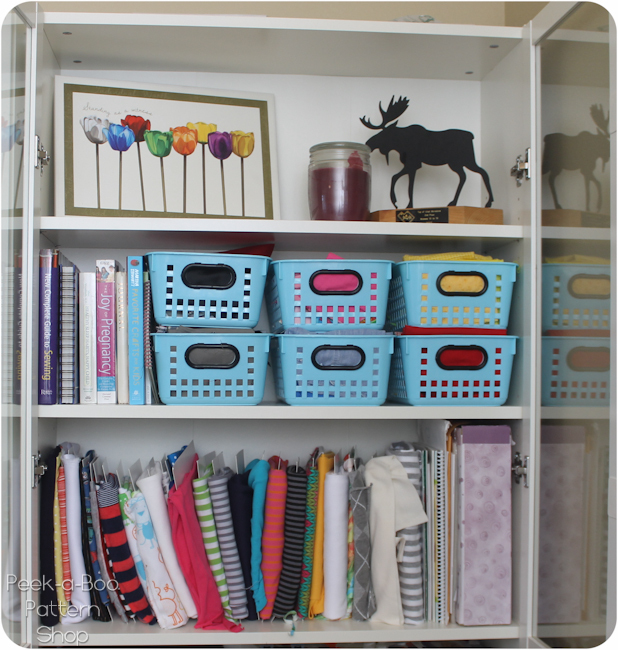 I was looking for ways to organize my sewing area and I really like some of these ideas. I love that you have a separate space for upcycles. I’m just now getting in to them. Something I haven’t really seen yet is how bobbins are stored. I have them in a little tin so they all stay together but they unwind and tangle pretty easily. Any suggestions? I bought a bobbin box on Amazon recently, it wasn’t too expensive (around £1.50) and does the job nicely. Have a look! 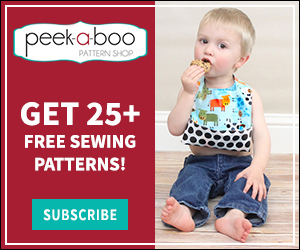 How do you store your PDF patterns? Just curious! I bet you have a lot of them,hahaha.